Imagine you’re in a room full of 50 women. What does it feel like? Most likely, it’s easy, calm, and somewhat tranquil. Now imagine that same room is full of 50 men. How did the energy in the room change? Is it more intense? 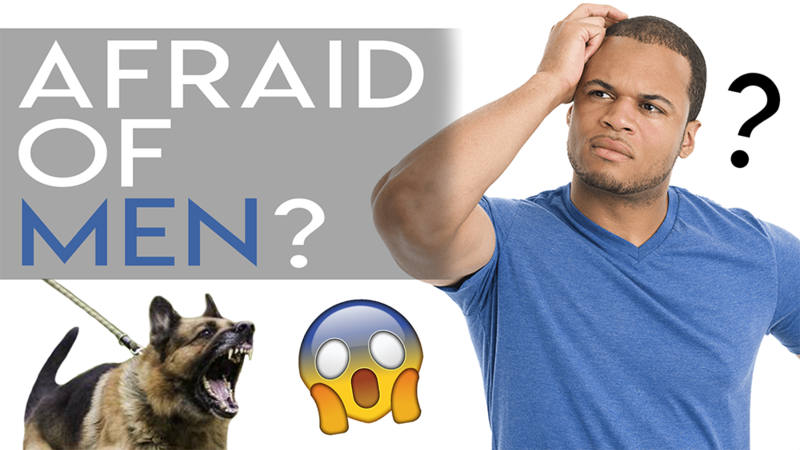 This is the biggest reason many dogs are intimidated by or afraid of men. Men and women are simply different. Equal, but different. Generally, men have a more intense energy and composure about them than women, and dogs are very sensitive to that energy. For a shy, nervous, or unstable pup, this energy is very assertive and makes them feel anxious or afraid. It’s all about the vibe. I really don’t believe that every dog that is reactive to men has been abused by a man. If this were the case our society would be in the dumps. Many of the dogs I meet have been raised in a family with loving men and still have this reaction to strange men. So How Do I Make My Dog Comfortable Around Men? Don’t look. (Most important!) — Instruct everyone to avoid eye contact – peripheral vision is great! Every time a new person is introduced to your nervous pup, especially men if they’re fearful, there should be no looking at the dog, no talking to the dog, and no petting the dog. Eye contact is a social pressure to dogs. It is imperative to understand the way they perceive this. This goes against our natural instincts to love on that adorable, furry face, but allowing someone to be in the dog’s area and touch them when they are afraid will create more fear. They will also be less trustful of you, their leader, for putting them in a scary situation. Remember, as leader, you are the protector! 1. Be sure the dog is calm before receiving affection (petting, sweet talk, treats). 2. Pet from underneath, never over their head. In the dog world, anything over the body or the head is very intimidating and can be interpreted as aggressive behavior. To make your pup feel more at ease when someone pets them, you need to let them know that petting underneath is better (on the chest, for example). This will keep your dog calm during this new interaction. 3. Be firm with people. Anytime you do something new with your dog, especially if it is not commonplace, people may not listen or may not understand you. Be firm and put your dog first. It is your responsibility as their pack leader to protect them and make them feel safe. If someone does not respect their space or sweet talks them when you’ve asked them to do otherwise, don’t be afraid to speak up. Your pup needs a confident, secure leader to make them as happy and safe and they can be. We’re very glad you found this information useful! Thanks for stopping by Heather!